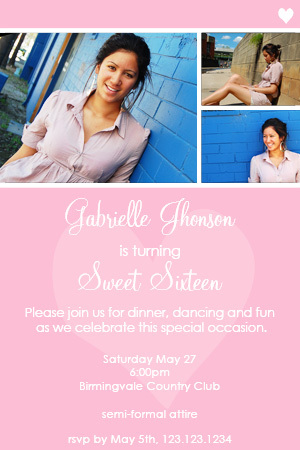 A beautiful invitation with room for up to 3 photos of your sweet girls 16th birthday party celebration. The background is colored in baby pink with a couple of cute heart designs. The photographs can be switched out for just the one picture if you wish. We can also do two photos as well. You can also change the background color. Simply request your own color choice in the 'design requests' section of the order form. Available as a "print it yourself" 4"x6" or 5"x7" jpeg file. You can print off as many copies as you like.